Why is there official deafening silence in regards to any Diego Garcia satellite and communication records that were gathered in the course of the MH370 investigation ... Diego Garcia satellite and communication records regarding suspected happenings encompassing the morning of March 8, 2014? Think about it. Diego Garcia is a US military base in that middle of the Indian Ocean that has reportedly served as a base for launching/refuelling planes that were headed to Iraq and Afghanistan. It has also been reported that Diego Garcia has served as a detention centre for the purpose of interrogating suspected Islamic terrorists prior to being transferred to Guantanamo Bay. Could it be that the Malasian pilot of MH370 asphyxiated all passengers/ crew on board when he assented to and stayed at a maximum altitude for over twenty minutes? Could it be that the pilot was privy to an oxygen supply? Could it be that the Maylasian pilot had planned and practised ahead with the use of his flight simulator how he would reach Diego Garcia undetected with the intent of crashing MH370 into a strategic target on the Island with the intent of hindering the objectives of the top secret US military base? Could it be that the pilot failed to consider the possibility of being observed by Maldive residents while flying at a very low altitude over their Islands on the route towards Diego Garcia? Could it be that in the name of national security the searches for MH370 in the South China Seas and the South Indian Ocean have been an attempt to distract world attention from a top secret US Miliary base? It is my sincere hope that the families of MH370 receive the answers and proof they so desperately seek regarding the search areas. Despite my suspicions to the contrary ... 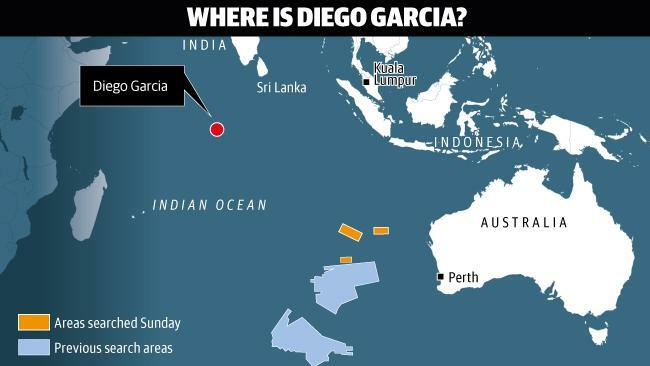 I would lay my theory to rest IF it was learned that behind the scenes Diego Garcia has been a focus of the search for MH370 ... a focus that was ruled out through satellite and communication early on through records. The families have 26 questions they want answered now. Some of the "questions" are requests that evidence be shared with them, including the flight's logbook and recording of air traffic control on March 8, the night the plane disappeared with 239 people aboard. Many of the 26 questions focus on technical issues involving emergency locator transmitters, or ELTs, and "black boxes." With an apparent in-depth understanding of how these work, the families ask about the specific technology on the missing plane. A meeting between relatives of Chinese passengers aboard missing flight MH370 and Malaysia Airlines staff has descended into chaos, with police stepping in to separate both sides amid angry scenes in a Beijing hotel. Up until three weeks ago, Malaysian government and military officials held regular briefings with the relatives to update them on the search for the Malaysia Airlines Boeing 777 that went missing on March 8. The relatives last month staged an angry protest at the Malaysian embassy in Beijing. Nothing has been seen of the plane or its 239 passengers and crew since it vanished off radar screens during a flight from Kuala Lumpur to Beijing on March 8. CNN) -- As word came Thursday that the Malaysian government had filed a preliminary report about missing Malaysia Airlines Flight 370, Sarah Bajc implored that the nation's officials share it with passengers' loved ones. Bajc, the partner of American passenger Philip Wood, said the report is just one of many pieces of information families have been demanding that authorities release for weeks. On Wednesday, Steve Wang, whose mother was on the plane, demanded that Malaysian authorities release data for which family members have asked. He and other relatives have said they do not accept the announcement by Malaysian authorities that the plane went down in the southern Indian Ocean. Wang said "the relatives are doubtful that they are searching the right place." Malaysia Prime Minister's Flip Flop?? RAZAK: Right now I think I need to take into account the feelings of the next of kin. And some of them have said publically that they're not willing to accept it until they find hard evidence. BEIJING -- A grim-faced Malaysian prime minister had an emergency late-night news conference Monday, saying that the long-missing Malaysia Airlines flight 370 “ended in the southern Indian Ocean” with no hope of survivors. Najib Razak said his conclusion was based on new data from the British satellite company Inmarsat, identifying the last known location of the flight as southwest of Perth, Australia. "This is a remote location far from any possible landing sites. It is therefore with deep sadness and regret that I must inform you, that according to this new data, flight MH 370 ended in the southern Indian Ocean,’’ he said delivering his brief statement at the news conference in Kuala Lumpur. As Razak spoke, airline representatives met with family members in Beijing. “They have told us all lives are lost,” one relative of a missing passenger told CNN. As my father used to say "Something is rotten in the state of Denmark". Why "Denmark"? I don't have a clue. PM RAZAK: The military radar, the primary radar has some capability. It tracked an aircraft which did a turn back, but they were not exactly sure whether it was MH370. What they were sure of was that the aircraft was not deemed to be hostile. QUEST: Where they tracking it on the night, at the time it was flying? Or is that an expo facto, when they went back and looked at it? PM RAZAK: There were, I believe there was a man who was monitoring the radar screen but the interpretation was done after the event. QUEST: So, no planes were sent up on the night to investigate? PM RAZAK: No because, simply, it was deemed not to be hostile. QUEST: Don’t you find that troubling that a civil aircraft can turn back, fly across the country and nobody thinks to go up and have a look? Because one of two things – I understand the threat level – either the plane is in trouble and needs help or it’s nefarious and you really want to know what someone going up there to do. So, as the prime minister, don’t you find that troubling? PM RAZAK: You see I’m coming back to my earlier statement – they were not sure whether it was MH370. QUEST: Even more reason to go have a look. PM RAZAK: They were not sure. But it behaved like a commercial airline following a normal flight path. Subang, 25 April 2014: Malaysia Airlines confirms that its staff were held at the Lido Hotel ballroom in Beijing by the family members of MH370 as the families expressed dissatisfaction in obtaining details of the missing aircraft on 24 April 2014 at 3pm. The 200 over family members requested for the presence of a Malaysian official as only Malaysian Airline staff were present at the briefing session. The 10 airline staff, then, were told to wait at the ballroom whilst a group of 60 family members left for the Malaysian Embassy in an attempt to get a government official to attend the briefing. The group finally released the staff at 1:44am, 25 April 2014. In another incident, Malaysia Airlines Security supervisor, Kalaichelven Shunmugam was attacked by a Chinese family member whilst on duty at Lido Hotel in Beijing on 22 April 2014. The airline staff tried to stop an aggressive family member who demanded access to the secretariat, when the latter kicked the staff in his left knee. Those at the scene managed to defuse the situation and later brought Kalaichelven to the secretariat for first aid assistance. The staff sustained only light injury. Malaysia Airlines had filed a police report following the incident. Dispelling weeks of speculations that the missing Malaysian Airlines plane MH370 would have used the technique of 'terrain masking' by flying low to remain undetected, Malaysian Prime Minister Najib Razak has now stated that an unidentified aircraft was in fact detected by the military radar on the day the flight mysteriously vanished. The comment comes as a sharp U-turn from the Malaysia government, after earlier claiming that its civilian radar had not detected any aircraft, and that MH370 had mysteriously disappeared in the wee hours of 8 March, carrying 239 people onboard, on its way to Beijing from Kuala Lumpur. "The military radar, the primary radar, has some capability," Razak told CNN in an interview. "It tracked an aircraft which did a turn back but they were not sure, exactly sure, whether it was MH370... What they were sure of was that the aircraft was not deemed to be hostile." The surprise announcement, which seems to be completely inconsistent with the earlier claims by the Malaysian government, is only likely to raise more staunch questions on whether Malaysia is hiding something from the public. Family members of the missing jet stormed the Malaysian Embassy in Beijing on Friday, demanding answers. Up to 8 military aircraft and 10 ships are planned to assist in today's search for missing Malaysia Airlines flight MH370. Today the Australian Maritime Safety Authority has planned a visual search area totaling approximately 49,240 square kilometres. The centre of the search area lies approximately 1584 kilometres north west of Perth. The weather forecast for today is for isolated showers, with south easterly winds up to 25 knots, sea swells of two to three metres and visibility of one kilometre in thunderstorms and three kilometres in rain. Bluefin-21 AUV is currently completing mission 13 in the underwater search area. Bluefin-21 has now completed approximately 95 per cent of the focused underwater search area. No contacts of interest have been found to date. Any further information will be made available if, and when, it becomes available. Up to 8 military aircraft and 11 ships are planned to assist in today's search for missing Malaysia Airlines flight MH370. Today the Australian Maritime Safety Authority has planned a visual search area totaling approximately 57,311 square kilometres. The centre of the search area lies approximately 1584 kilometres north west of Perth. The weather forecast for today is for isolated showers, with south easterly winds up to 20 knots, sea swells of two to 2.5 metres and visibility of one kilometre in thunderstorms and three kilometres in rain. Early into mission 13 yesterday Bluefin-21 was recovered due to a software issue that required resetting. The AUV has technically sophisticated equipment and a reset is not uncommon. Overnight Phoenix technicians resolved the issue and mission 14 is now underway. Bluefin-21 has completed approximately 95 per cent of the focused underwater search area. No contacts of interest have been found to date. The focused underwater search area is defined as a circle of 10km radius around the second Towed Pinger Locator detection which occurred on 8 April. If no contacts of interest are made, Bluefin-21 will continue to examine the areas adjacent to the 10km radius. Any further information will be made public if, and when, it becomes available. Due to deteriorating weather conditions, the planned air and surface search has been suspended for today. Bluefin-21 has completed mission 14 and is expected to commence mission 15 this morning. Bluefin-21 is expected to complete the focused underwater search area and continue examining the areas adjacent to it during mission 15. Up to 9 military aircraft and 12 ships are planned to assist in today's search for missing Malaysia Airlines flight MH370. Today the Australian Maritime Safety Authority has planned a visual search area totaling approximately 54,921 square kilometres. The centre of the search area lies approximately 1667 kilometres north west of Perth. Bluefin-21 has completed mission 15 and has commenced mission 16 this morning. Bluefin-21 will continue to examine the areas adjacent to the focused underwater search area during mission 16. The weather forecast for today indicates the cold front will move out of the search area and be replaced by a southerly trade flow, sea swells of four to five metres. Australian Prime Minister Tony Abbott said the aerial search for missing Malaysia Airlines Flight 370 is being suspended, with search efforts focusing underwater. In a Monday press conference, Abbott said side-scan sonar equipment is needed. A Bluefin-21 underwater autonomous vehicle has been scanning the ocean in areas where signals – consistent with the pings from a plane's black boxes – were detected. While the Bluefin-21 hasn't detected anything connected to the jetliner, authorities say it will continue to be deployed. "We're still baffled and disappointed that we haven't been able to find wreckage based on those detections," Abbott said. "It's the best information that we've got. It may turn out to be a false lead, but nevertheless, it's the best lead we've got. Retired Australian Air Chief Marshal Angus Houston, who is coordinating the southern Indian Ocean search, also spoke at the press conference, saying "We haven't found anything anywhere that has any connection to Flight 370." Numerous reports of objects, satellite images and oil slicks in the southern Indian Ocean have turned up fruitless. (CNN) -- The search for the missing Malaysia Airlines plane will be entering a new phase that will use private contractors and may cost about $60 million, Australian Prime Minister Tony Abbott said Monday. "I regret to say that thus far none of our efforts in the air, on the surface or under sea, have found any wreckage," he said. The new phase will focus on searching the ocean floor over a much larger area -- 60,000 square kilometers, a process that will take about six to eight months. "We do not want this crippling cloud of uncertainty to hang over this family and the wider traveling public," he said. It is "highly unlikely" that any debris will be found on the ocean surface, Abbott said. By this time, most of the debris will have become waterlogged and will have submerged, he said. As such, authorities will be suspending aerial searches. Malaysia's government has been widely criticized over its handling of the search for missing Malaysia Airlines Flight 370 and disclosures of its investigations. But on Sunday, U.S. President Barack Obama had words of praise during a visit to the southeast Asian country. He said the Malaysian government has been "forthcoming" with the United States about the information it has. "The Malaysian government is working tirelessly to recover the aircraft and investigate exactly what happened," Obama told reporters. He reiterated that the United States would continue to aid in the search and offered condolences to loved ones of those lost. The failure of the initial underwater search to find any trace of the plane has left Australian officials with no fresh leads. The batteries on the plane's "black-box" beacons are long dead. A lengthy and costly air-and-ship search of the ocean's surface has dredged up only random flotsam, such as discarded fishing nets. In Malaysia, the absence of any tangible evidence of where the plane went down, such as debris, has meant some relatives have held out hope the plane didn't crash in the ocean. "Maybe it is time for the government to rethink where the search should be," said Selamat Omar, whose son Mohammed Khairul Amri Selamat was a passenger. "Look for the plane on land."